Are Nanoparticles Engineered into GM Foods Causing Cancer? In modern agriculture, it is not possible to only spray weeds without spraying soy and corn crops. Glyphosate is therefore genetically modified (GM) to kill only weeds while at the same time enhancing the growth of crops. However, glyphosate does not readily penetrate the leaves of weeds and crops, and therefore is mixed with adjuvants that aid leaf penetration. For decades, nano particles (NPs) and specifically carbon nano tubes (CNTs) that readily penetrate leaves have been used as adjuvants allowing glyphosate to be carried to plant roots for more efficient absorption. Upon human consumption of GM foods, most glyphosate and included NPs are rapidly excreted, but residues  remain in the human gut. Indeed, the important question of NPs in GM foods is the same as that of nanotechnology in general: Do NPs contribute to the wide range of health problems? Donald Huber, the prominent critic of GM foods claims soil-borne plant pathogens are produced that do indeed harm human health, e.g., residents living close to sprayed GM soybeans fields in Argentina developed cancers and birth defects. However, GM food proponents argue science is still looking for, but not found Huber’s pathogen to establish the causal link between glyphosate and human health problems. Regardless, the question remains: Is there a causal link between NPs in GM foods and human health? In 2013, Waking Times published an article on how the food industry is poisoning the very consumers who drive their multi-billion dollar enterprises, even spending millions against the consumer’s right to informed consent, i.e., truthful GMO labeling. Although a causal link between GM foods and cancer is not made, titanium dioxide NPs common in GM food are cited  to proliferate epithelial cells of the gut and induce “tumor-like” changes common to cancer. Today, the problem is the effect of GM foods on human health is focused almost entirely on arguments as to whether Huber’s pathogen exists, instead of identifying the mechanism by which residues of NPs in glyphosate cause cancer by damaging human DNA. 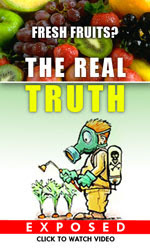 Only then would a causal link between GM foods and human health be biologically plausible. The causal link between ingested GM foods and human health is proposed to be the DNA damage by UV radiation from NPs in glyphosate residues in the gut. Today, only UV radiation from the sun on exposed human skin is known to cause cancer, but the gut is hidden from solar UV. How then do NPs in GM food produce UV radiation? Currently, damage to human DNA by UV radiation from NPs has not been recognized because classical physics always allows the atoms in NP to have the heat capacity to conserve heat from the gut by a slight increase in temperature, a consequence with insignificant DNA damage. Hence, DNA is now thought damaged upon direct contact with the NP material, but this notion can be dismissed as chemically inert NPs are also known to damage the DNA. Quantum mechanics (QM) differs from classical physics by allowing electromagnetic (EM) radiation to be created in NPs. Unlike classical physics, QM requires the atoms in NPs to have vanishing heat capacity and therefore NP temperatures cannot increase upon absorbing heat in the gut. Instead, the NPs conserve heat by emitting EM radiation that causes the DNA damage, and if not repaired may lead to cancer. Similarity is found with ovarian cancer from NPs in talcum powder products used in cleaning genital areas. Vanishing heat capacity of the atom by QM is not new, but the consequence of the Planck law was formulated over a century ago. For heat capacity to vanish, however, the NP must be placed under high EM confinement, but the NP does not provide any physical is not physical confinement. Instead, NPs having high surface-to-volume ratios require absorbed heat to be momentarily confined to their surface thereby providing high EM confinement over nanoscale dimensions. Since the NP temperature cannot increase by QM, conservation proceeds by quantum electrodynamics (QED) converting the surface heat into EM waves standing between diametrically opposite NP surfaces. QED stands for quantum electrodynamics. But QED here differs from the complex light-matter interaction theory advanced by Feynman and others. Simply stated: Absent heat capacity, heat supplied to a NP of diameter d is conserved by creating standing EM waves having half-wavelength ? / 2 = n d, where n is the NP refractive index. Once the surface heat is expended in forming the standing waves, the EM confinement vanishes allowing the NP to emit EM radiation that damages the DNA of adjacent cells, e.g., zinc oxide NPs having diameter d = 50 nm and n = 2.5 emit UV-C radiation at about 254 nm, a lethal level for the DNA damage in all living systems as the pyrimidine dimers are formed that block DNA replication. Smaller NPs emit even higher frequency EM radiation. See diverse QED applications at, Ibid, 2010 – 2016. Huber’s pathogen that links GM foods to human health is unlikely to exist as the problems (cancer, autism, birth defects, Parkinson’s, etc.) are widely diverse and cannot be linked to any single pathogen. Indeed, the diversity of health problems suggests the presence of many different pathogens as the mechanism for their creation is the scrambling of genes from damaged DNA. The causal link between NPs in GM food and health problems is clearly the UV radiation emitted by NPs. To protect consumers, DNA damage tests, say comet assays, should be performed on GM foods and safe concentrations of NPs labelled accordingly. Thomas Prevenslik is a retired American living in Hong Kong and Berlin. Because classical physics does not work at the nanoscale, he developed the theory of QED radiation based on quantum mechanics. Please visit http://www.nanoqed.org . S. Richard, et al., “Differential Effects of Glyphosate and Roundup on Human Placental Cells and Aromatase,” Environmental Health Perspectives, 113, 716-720, 2005. M. C. Botelho, et al., “Effects of titanium dioxide nanoparticles in human gastric epithelial cells in vitro,” Biomed Pharmacother. Aug 23, 2013. PMID: 24051123. This article (Are Nanoparticles Engineered into GM Foods Causing Cancer?) was originally created and published by Waking Times and is published here under a Creative Commons license with attribution to Thomas Prevenslik and WakingTimes.com. It may be re-posted freely with proper attribution, author bio, and this copyright statement.